Hello lovelies! Today I have not one but three stunning polishes to share. This brand is also new to Nails Talk and originates from my favorite city, New York! Without further ado, let me introduce you to Starrily! 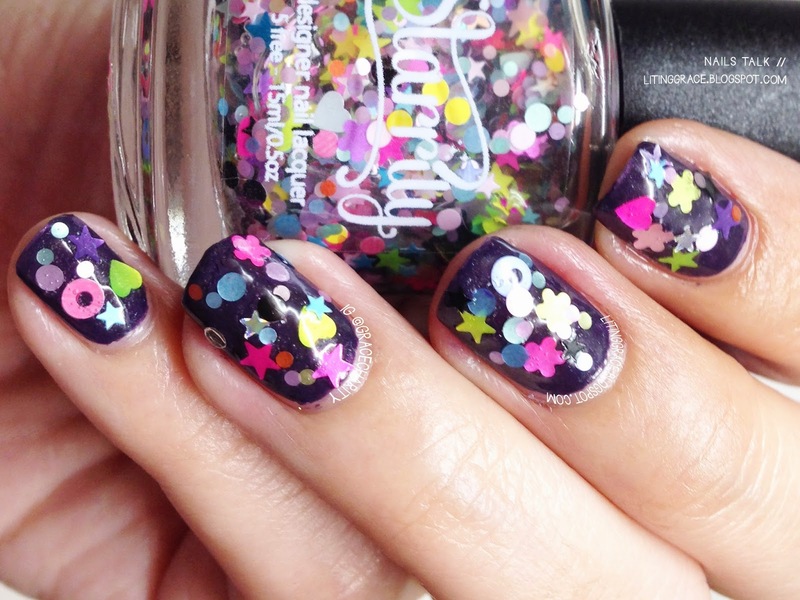 Starrily is a designer nail polish brand based in New York City. 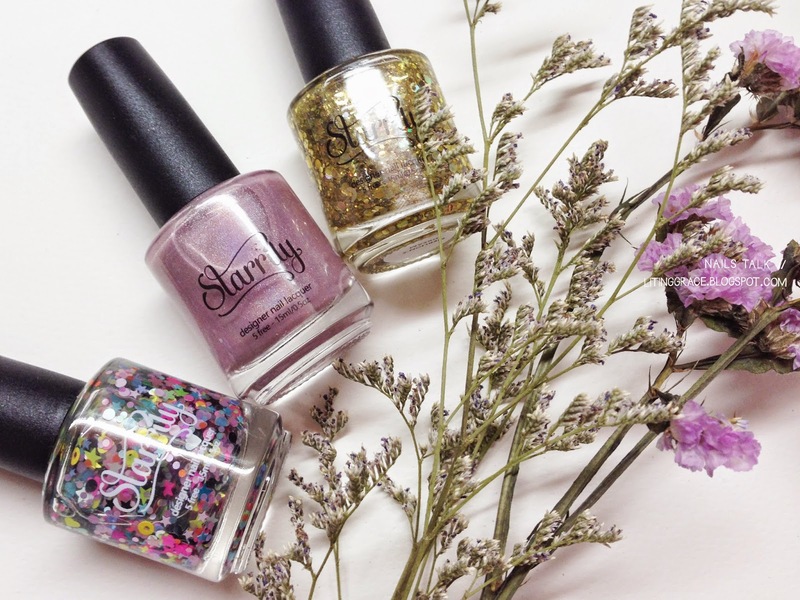 Starrily was created when founder, Mawish Ali, better known as Mawi, ventured out to bring fun and lively nail lacquers into the nail industry. After receiving several requests from customers for custom made nail polish, Mawi had an idea to let customers completely design and name their own nail polish through a simple method. 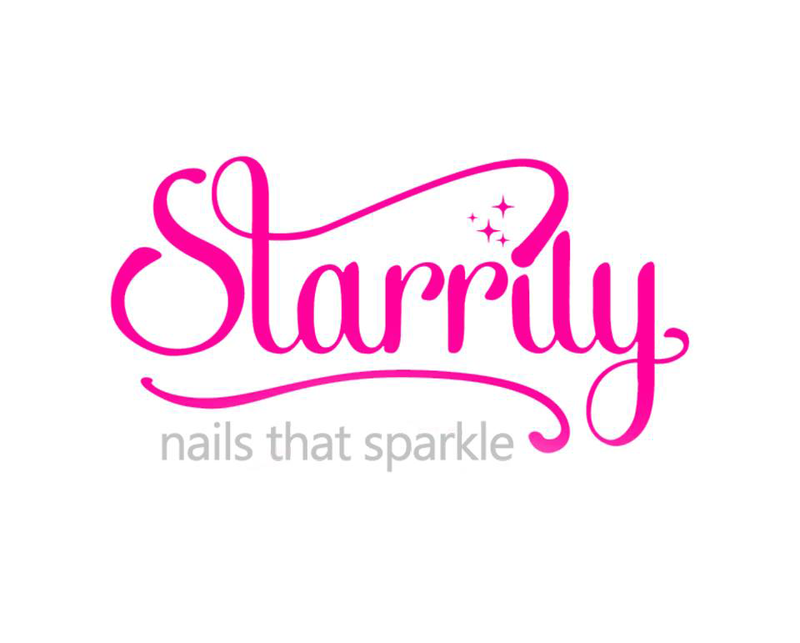 Starrily plans to continue improving and moving forward with this system to let customers create their own special nail polish. 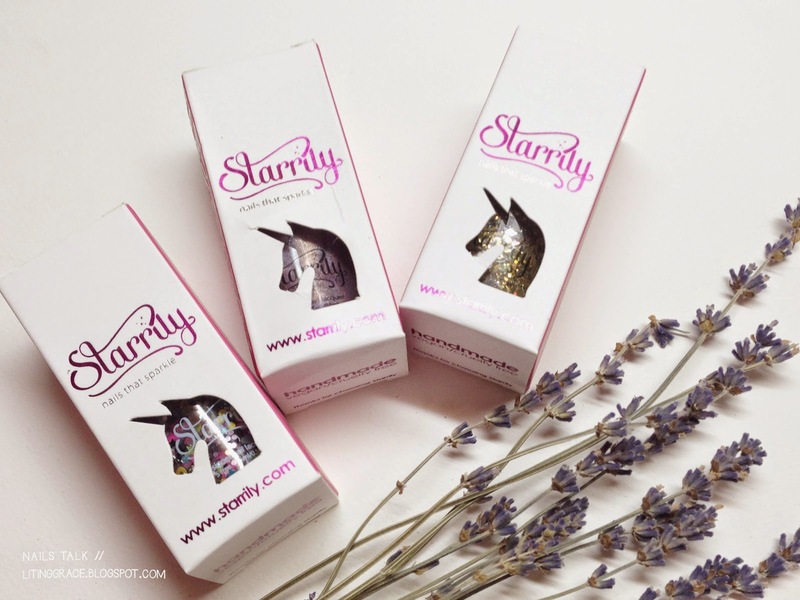 Starrily nail lacquers are 5-free, and handmade in small batches using high quality raw ingredients. Each bottle of Starrily is individually inspected and handled with love before it is shipped off to its new home. The Party Time! Siloso Beach Trio Collection consists of three polishes created exclusively for Mei Mei's Signatures. For the uninitiated, Siloso Beach located on Sentosa, is Singapore's hippest beach and home to the hottest volley boy action along with the coolest bars and restaurants. It's the beach to head for fun-loving people both during the day and night. 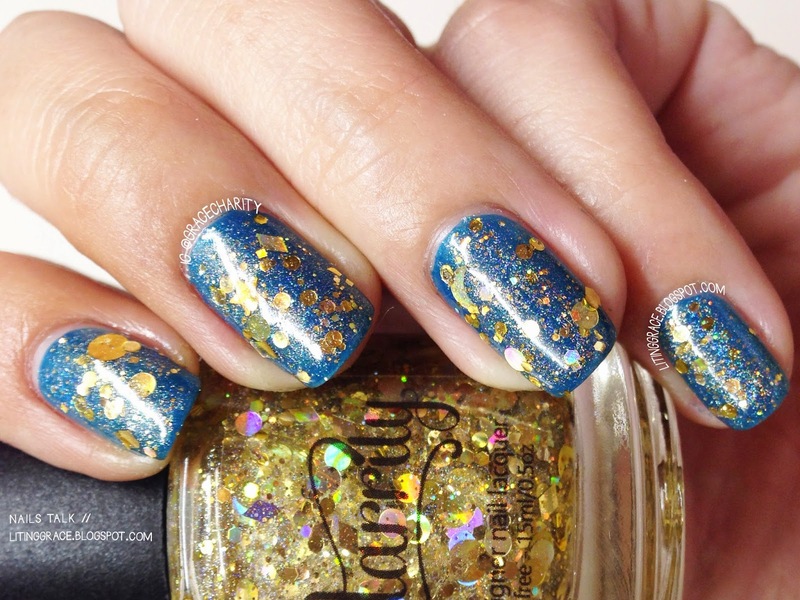 Merlion's Dream is a glitter bomb topper of gold glitters in various shapes and sizes in a clear holo base. I painted one coat of Merlion's Dream over Contrary Polish Surf. Despite the amount of glitters, application was a breeze. 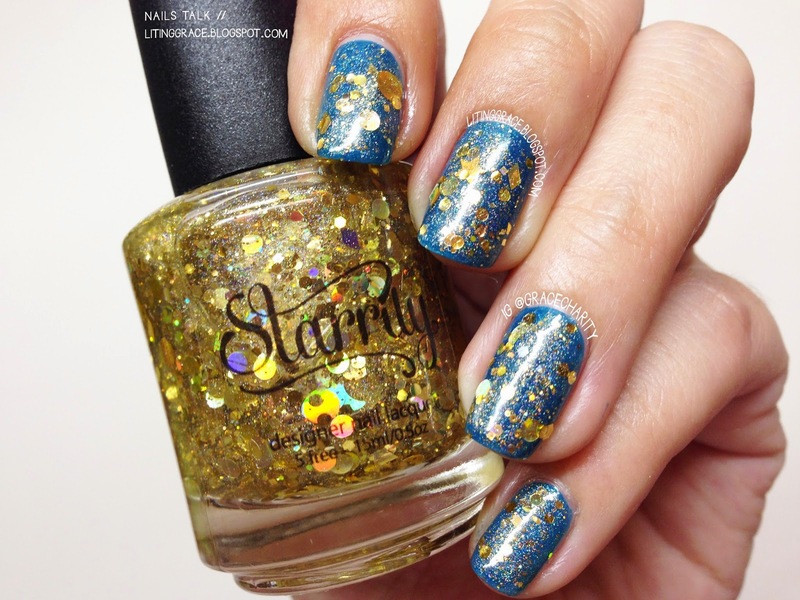 Songs of The Sea is bright and fun glitter topper in clear base inspired by the multimedia night show at Siloso Beach on Sentosa. Unfortunately it ran it's final show earlier in May this year to make way for a new multi-sensory production. Back to the polish. 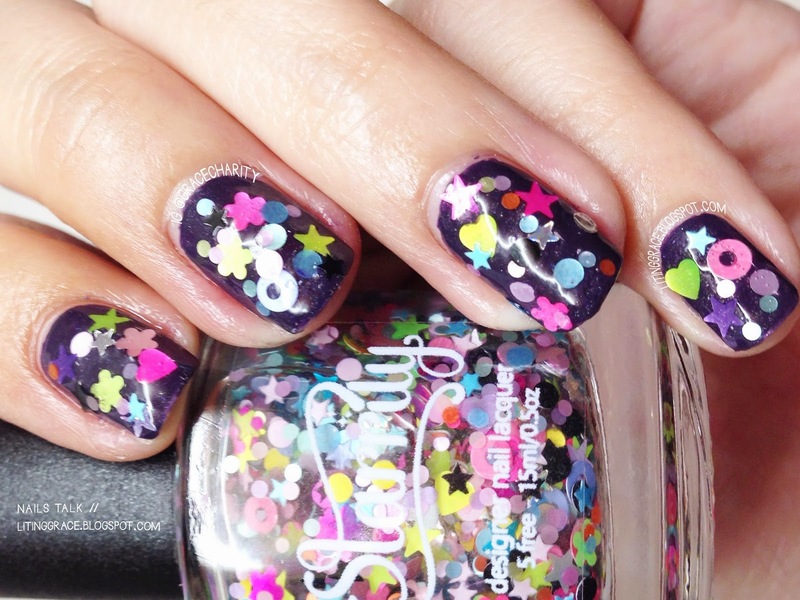 You'll find all kinds of shapes in this glitter topper; hearts, crescents, rings, stars, flowers, dots in rainbow colours. One of the most fun-loving polish I've come across. I chose to wear this over a dark base, OPI Vant To Bite My Neck, using the dabbing method. Despite the huge amount of glitters, no fishing was required. Pink Flip Flops is a baby pink jelly linear holo polish. This is a really sheer polish, I required four coats to reach opacity. The strong holo effect made up for it, so not much complaints here. Out of the three, Pink Flip Flops is definitely my favourite in this collection. A palate cleanser for those days when I wish to take a break from dark, vampy colours yet not boring. When it comes to pink, I tend to lean towards delicate shades like this, so it's really not hard to understand why I love this so much. The Party Time! Siloso Beach Trio Collection is sold out at the moment, but do follow Mei Mei's Signatures on her Facebook and Instagram for updates on restock, new colours and collections.